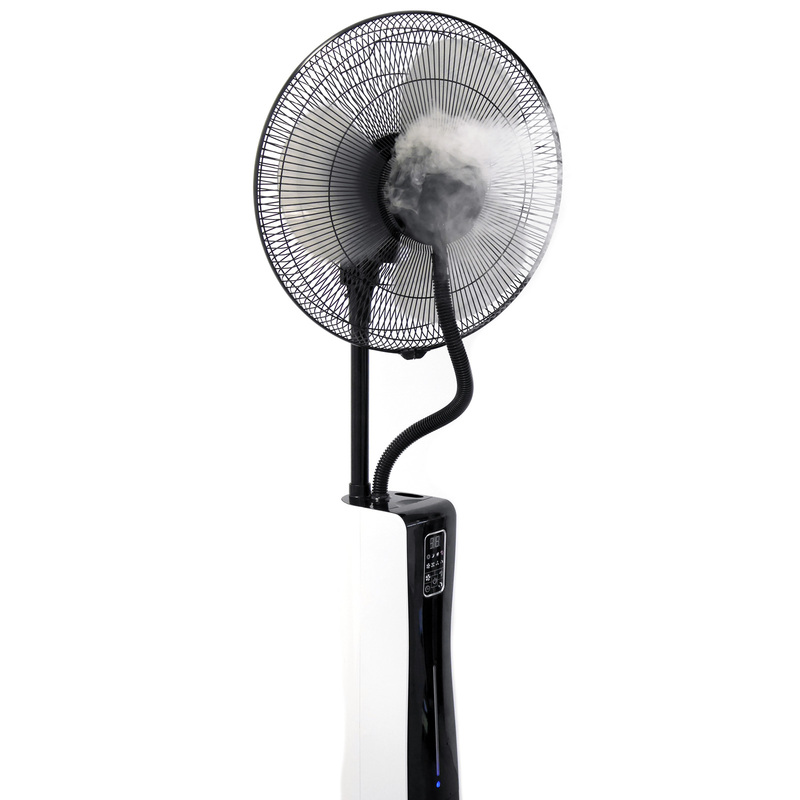 VASNER Cooly – the powerful pedestal fan & ultrasonic cool mist humidifier with water spray. 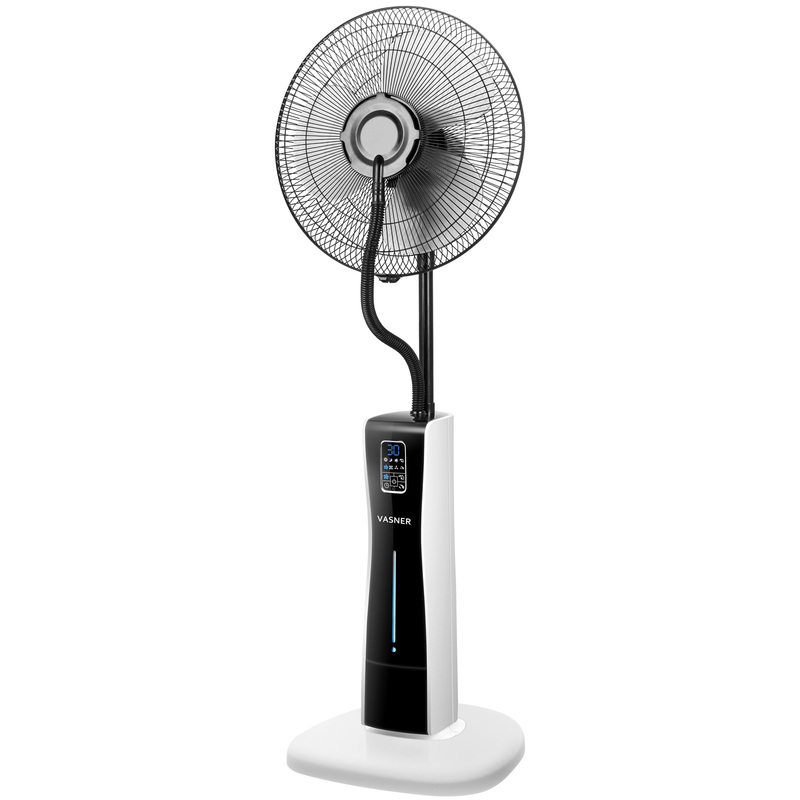 The remarkably powerful pedestal fan with state-of-the-art ultrasonic mist and a stylish design. VASNER for sheer refreshment. The new Cooly helps you cool off on extremely hot days. Our new pedestal fan & ultrasonic cool mist humidifier combines state-of-the-art technology with a sleek design. Its modern white look is perfect for stylishly furnished rooms and terraces. Our fan operates quietly thanks to its low wind noise. This helps you relax on your terrace, in your living room or in your bedroom on hot days. Aside from its normal fan function, our pedestal fan offers extra cooling features. 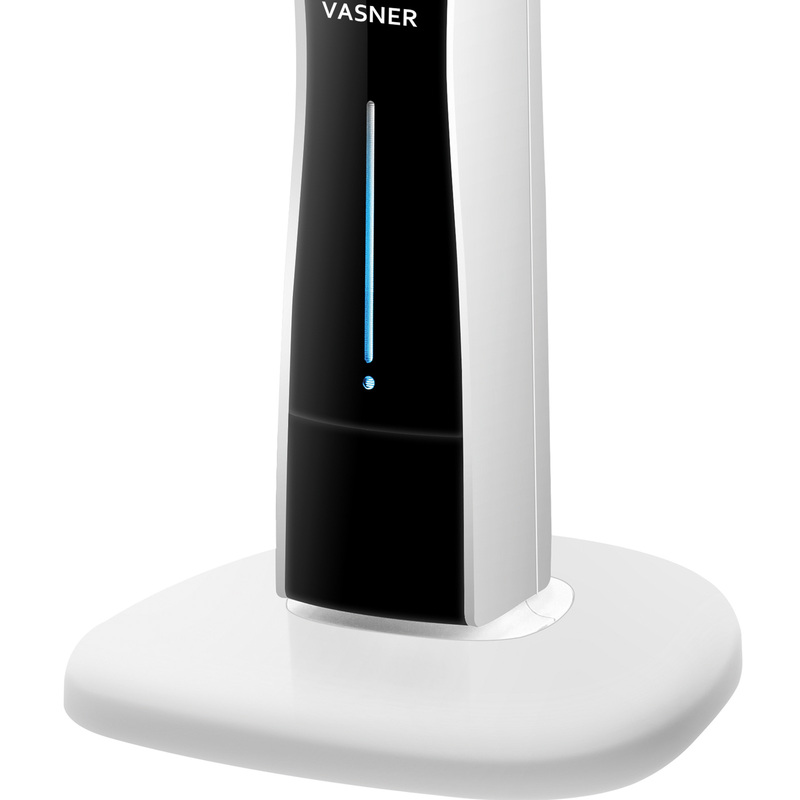 Its state-of-the-art ultrasound technology helps vaporize water and create tiny water drops. These are so small that real fog becomes visible. Smaller drops = bigger surface area = stronger cooling effect! The VASNER Cooly applies the same modern technology used by the fire department in the grueling heat. The finer the mist, the greater the surface area of the created water drops. This means more energy can be absorbed and a greater cooling capacity is available. For this purpose, Cooly applies state-of-the-art ultrasound technology to create tiny water drops. Its 2 litre tank is equipped with a glowing water level indicator and enables over 6 hours of water cooling. Nice and long. 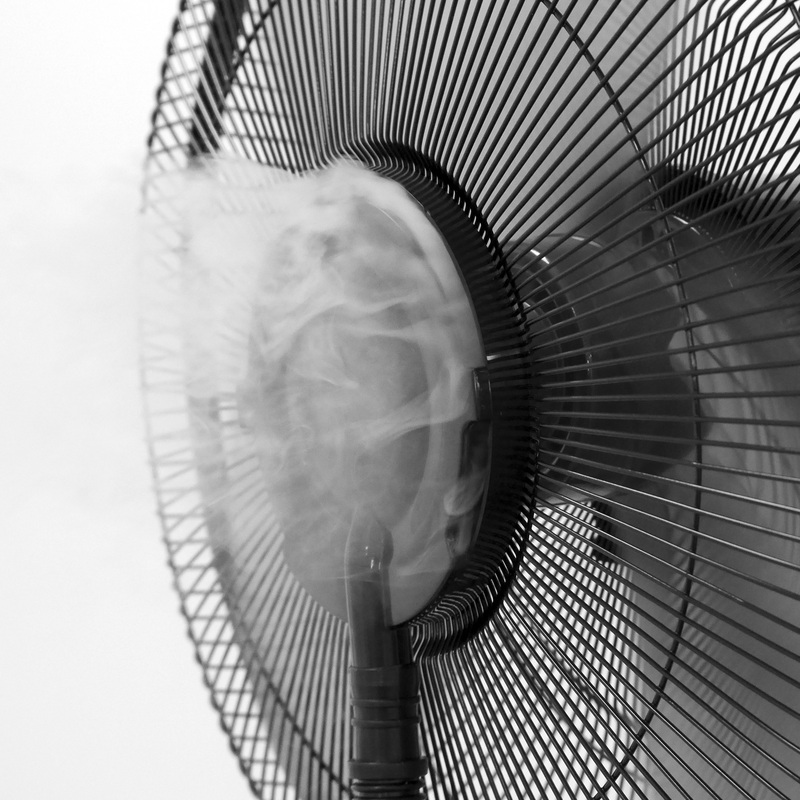 Use the remote control or the panel on the fan to activate the fog machine, if you’re in need of a stronger cooling effect. This feature comes in handy on hot windless days, especially if the heat in your bedroom is preventing you from falling asleep. Now you can sleep like a baby thanks to Cooly’s pleasant cooling effect. 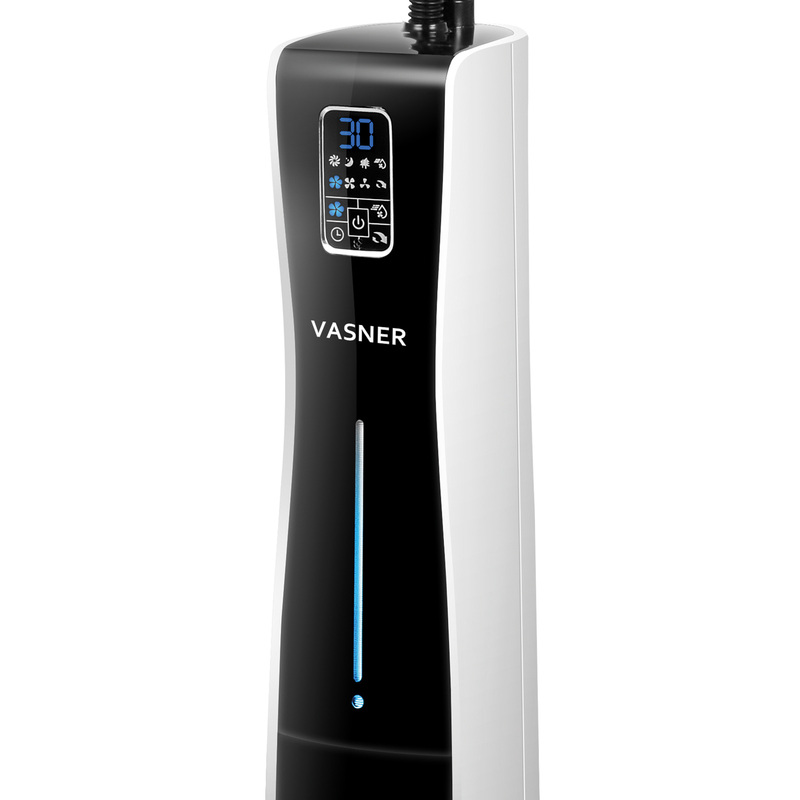 VASNER ultrasonic mist – for additional cooling power! Aside from its cooling effect, Cooly’s state-of-the-art ultrasonic mist has other benificial properties. It kills off the germs and bacteria that tend to accumulate in water. This means that only clean mist is emitted and the air quality in your room remains prestine. Additives and aromatic substances for pleasant room scents. Cooly’s technology allows aromatic substances / essences to be added to the water, creating pleasant scents in your room. Cooly – the true all-rounder with air freshening qualities. * Caution: Only use aromatic substances and essences suitable for ultrasonic fog machines! The 3-blade rotor of our pedestal fan operates almost invisibly. Transparent and flexible plastic is used to guarantee a quiet and nearly invisible rotation of the blades. The shape of the rotors has been improved to achieve extra quiet ventilation. This helps prevent any disturbing wind noise. Enjoy the additional peace and quiet. Furthermore, the angle of the rotor blades has been adjusted to create more wind power without increasing the rotational speed. Slight inclinations enable the transport of even more air. Do you have company on your terrace or in your living room and need cool air to be blown in different directions? The optional swivel function lets our fan swivel horizontally in order to cool an even wider area. 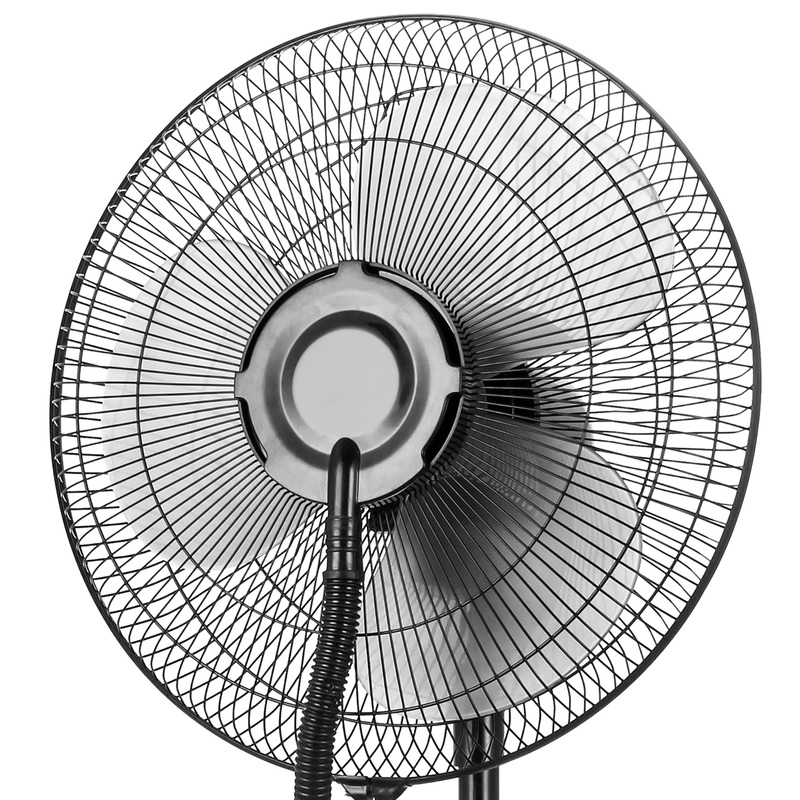 The head of the fan can also be tilted up or down manually to cool each corner of the room. Would you like the fan to turn off automatically after a certain amount of time? Or would you like it to turn on by itself and cool your home before you arrive? The integrated timer can be used for both scenarios. The switch-off and activation time can be set up to 12 hours in advance. Aside from its normal ventilation, the VASNER Cooly lets you choose two other wind modes. These enable an automatic alternation between different wind speeds – inspired by nature. For when you would like to feel natural air circulation on your terrace. 4 wheels can be attached to Cooly’s base plate. These remain completely invisible under the white sockets and let you move the fan from room to room conveniently. Refill the water tank easily. An integrated magnetic closure in the front plate enables a quick and easy removal of the water tank. Just fold it forwards, remove the tank, refill it and let the closure snap shut. Done! Quality expressed through thought out functionality. 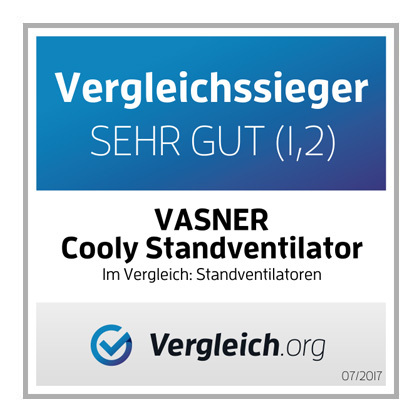 VASNER Cooly – the eye-catcher with extreme cooling power.